Powerful data recovery your business can depend on. Rescue your mission-critical documents in seconds with Recuva. Get Recuva Business! Get Recuva Business! 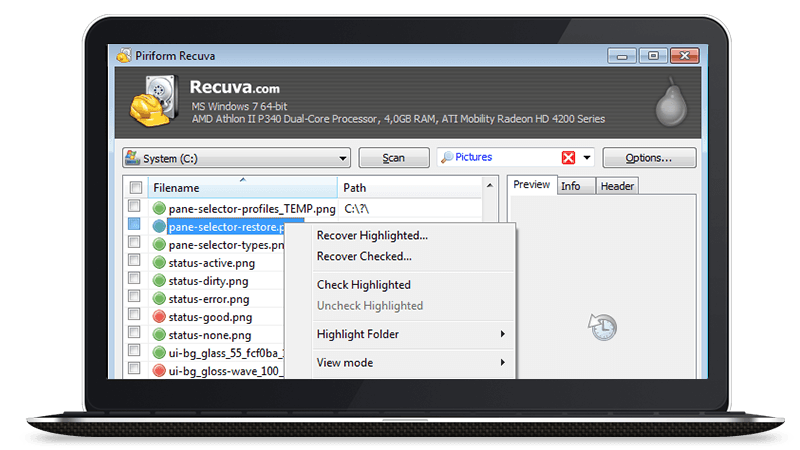 Recuva's superior search function tracks down files even if you can't remember their filenames. Restore files deleted weeks ago, from memory cards, recycle bin, and virtual disks. Internal, external and network drives; FAT, UDF and exFAT file systems. Whatever drive you need to recover from, Recuva Business Edition has you protected. Our software is tested to the highest standards and is trusted by millions of business users including many FTSE 100 companies. With premium support for your business, you can rest easy knowing we'll be here to help if you need us. *Unit Price excludes taxes. Each license covers 1 PC for 12 months. Windows 10, 8.1, 8, 7, Vista and XP (all editions including 64-bit), Windows Server 2012, 2008, and 2003 (all editions). Call for assistance with purchasing business products.